Sometimes it’s nice to leave the resort and head out into Mallorca. There are beaches, towns and restaurants to discover, as well as regular markets to browse and beaches to explore. One of the largest weekly markets on the island can be found in the town of Inca every Thursday morning. You’ll find the streets in the centre of town alive with stalls that sell everything imaginable. From fruit and veg to shawls, flowers, soaps and souvenirs, it’s a bustling, colourful experience that you will definitely enjoy. The town of Inca is famous for its leather goods, so you’ll see plenty of bags, jackets, shoes and other leather treasures in the stalls. 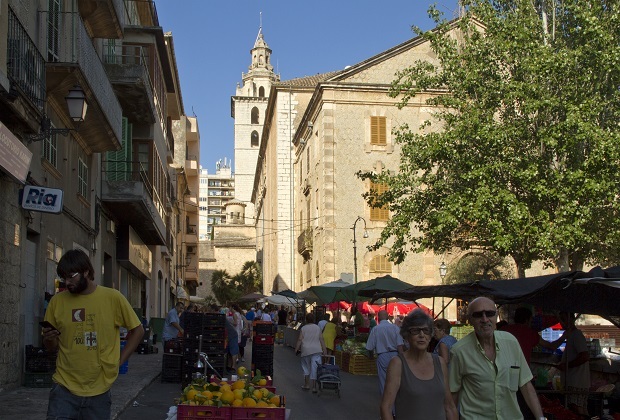 Be prepared to spend hours at the market as there are hundreds of stalls to discover. Inca itself is a fairly large town in Mallorca and is located on the main road from Palma to Alcudia. You could book a half day excursion to Inca, just ask at reception for details of how to do this. Or you can get buses – it will take around an hour and a half at the most and usually means two buses and a short walk from our site. To work out a route, enter the details here. Inca isn’t just about the market, although it could keep you busy for a whole day! Check out the fantastic restaurants serving up traditional Mallorcan food, and enjoy the pavement café culture of this typical Spanish town. If you’d rather drive to Inca, then you can hire a car. We can help you get a good deal on the best car for your trip. Once you’ve had your fill of the market then you could visit the nearby town of Binssalem. Famous for its vineyards and for the production of Mallorcan wine, it’s a great extra to your day trip. Inca is also very near to the foothills of the Tramuntana mountains. You could take a scenic drive through the countryside to pone of the villages, or follow one of the walking trails if you fancy a hike. And, when you’ve had your fill, you can hop on back to Club MAC for our programme of evening entertainment – sounds like a good day to us!